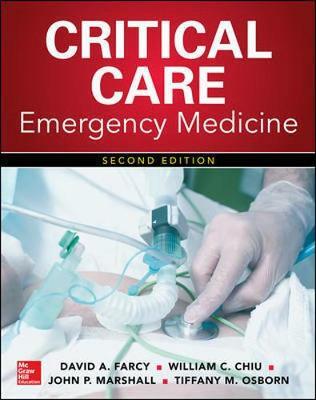 Author(s) Chiu, William C.; Marshall, John P.; Farcy, David A.; Osborn, Tiffany M.
Critical Care Emergency Medicine has become the standard reference for all clinicians who wish to understand the overlap between emergency medicine and critical care. Written by experienced emergency physicians and intensivists, the book is unique in incorporating both perspectives into the practice of emergency medicine and critical care. Critical Care Emergency Medicine teaches emergency physicians everything they must know and do to better care for critically ill patients in an emergency department or to provide care in an ICU. Enhanced by numerous algorithms that speed decision making and full-color illustrations demonstrating anatomy and technique, this book is an essential practice tool. Readers will also find important information on the use of ultrasound, fluid management, nutritional support, pediatric considerations, patient transportation, and end-of-life issues.